In the contemporary discipline of conflict resolution, adjudication and alternative dispute resolution (ADR) are often seen as antagonistic trends. This important book contends that, on the contrary, it is the bringing together of these trends that holds the most promise for an effective system of international justice. 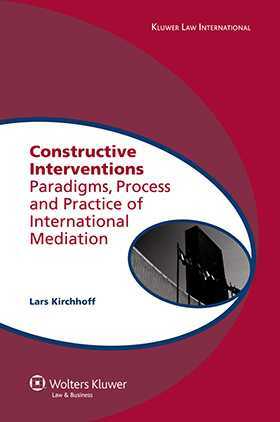 With great insight and passion, built firmly on a vast knowledge of the field, Lars Kirchhoff exposes the contemporary structural barriers to effective conflict resolution, defining where adjudication ends and ADR—and particularly the recent development of mediated third party intervention from an ‘art’ to a veritable ‘science’—must come into play. • clarifies the particular model of international mediation under development through UN initiatives.. In approaching these intertwined topics, the author draws concrete conclusions for the realms of international law and related disciplines as well as for the organizational context of the United Nations. He explores such diverse scenarios as conflicts between States, conflicts involving international organizations, and—in accordance with the changing parameters of international law—even conflicts involving individuals, clarifying which constellations can be tackled by international mediation and which conflicts should be dealt with by other forms of diplomacy or adjudication. It is the conviction of many intermediaries and scholars that the considerable potential inherent in resolving conflicts peacefully is rarely put into practice. Although some of the reasons for this phenomenon are beyond the influence of scholarly debate, in many instances the reasons for failure of peaceful resolution processes are more structural or systemic in nature. It is the great virtue of this book that it establishes enough clarity in an unclear and complex field to make concrete and workable recommendations in these instances, and for that reason it will be of immeasurable value and benefit to all scholars, policymakers, and activists dedicated to the pursuit of peace. Preface. Aims and Design of the Book. 2. Third Parties and Conflicts.